Special Actions: Button and Motion activated sounds. 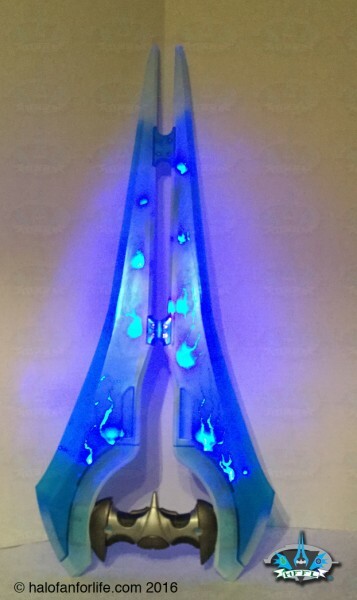 The sword flashes blue when ‘lit’. For those with epilepsy or if you have this around people with epilepsy, please do not light up. The sword is packaged well, within a walled off box, though the front is open for anyone to ‘test’ the electronics. Keep this in mind as the batteries are included, but may run down quickly, depending on how many people have tried it before you. (I also suggest cleaning off the toy first too, when you first get it, since this is accessible to the public and you don’t know what germs they may carry. On the back of the box there are a few details to take note of, which I will show close-up below. 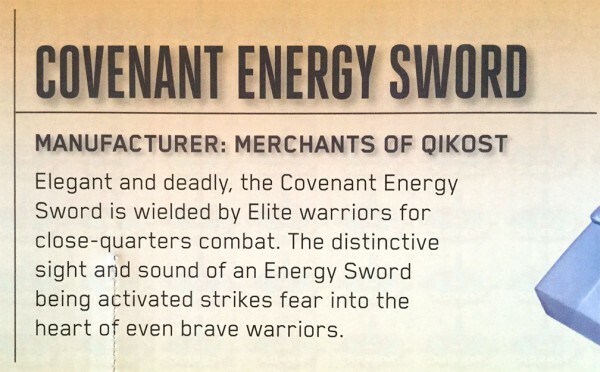 As stated earlier, the sword has lights within that blink quickly. As such, please use extreme discretion around anyone with epilepsy. 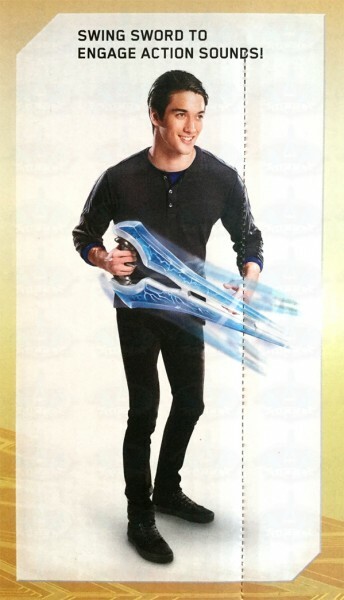 As shown here, swining the sword, even a little, can activate the sound feature. Do be careful not to poke anyone straight on. 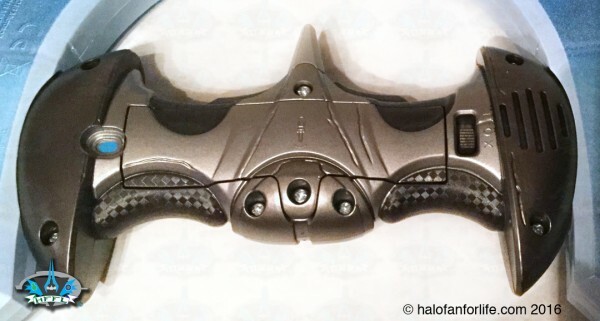 At the bottom of the rear of the box, Mattel shows their Halo acrtion figures as well as the Warthog and Ghost. I havne’t seen those vehicles yet. WHen I do, you can bet I’ll get them and post a review of them here. Okay, let’s get a little understanding of the way the sword is kept in place in the packaging and what you ned to do to remove it. There is a small instruction sheet included. You will find this between the insert cardboard piece and the back of the box. 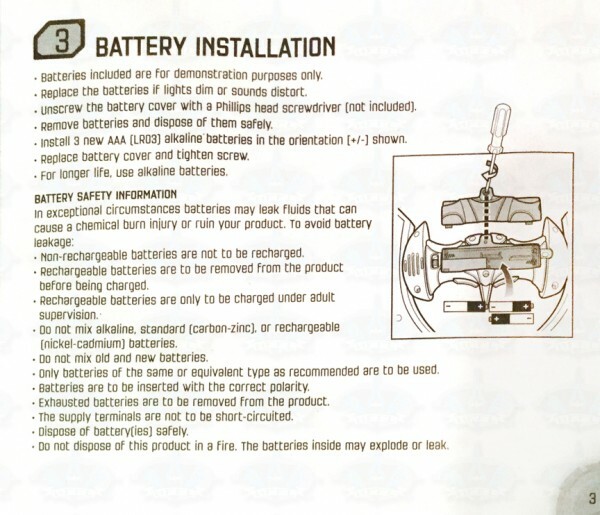 I’ve included this part of one of the pages for reference as to how to replace the batteries. 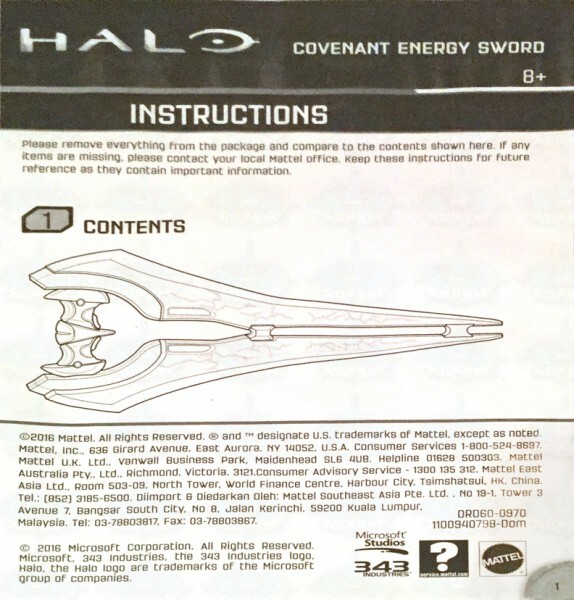 If you get one of these swords and lose your instruction sheet, check back here for these directions. Okay, let’s look at the hilt. This is the underside of the hilt. As you can see, it shows the battery door in the middle. Off to the right are the controls for on/off/test. Just right of that, the speaker for the sounds. Here’s a close-up of the switch. Oh and note the checker pattern on the hilt. Pretty cool! So finally, here is the sword out of the package. The blue plastic is slightly soft, though I would NOT try to strike anyone with it in any direction as it could definitely hurt someone. The tips are harder plastic and again, do NOT poke anyone with them. 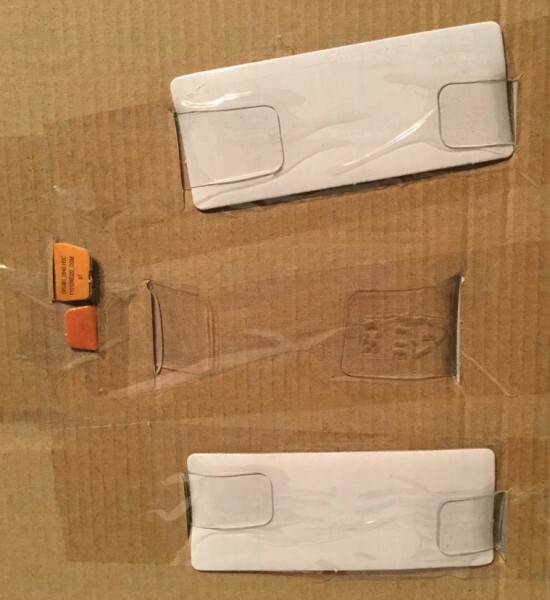 Along the insides of each of the blades, there is a hard white plastic strip. 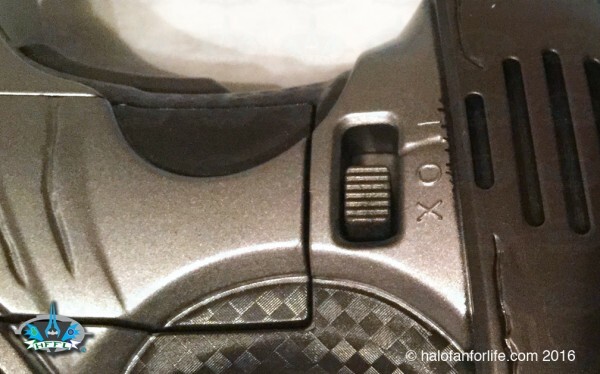 I believe this is where the electronics attach to. The blue plastic has a nice sheen to it. Note, between the blades the little ‘bridges’. There are screws to remove these. I have not done so myself. SO I am not sure if that will effect the electronics. I do know that it will destablize the blades a bit, so remove at your own discretion. I, again, suggest NOT doing that. And finally, the sword lit up. It’s impossible to get a good picture of this. Once I can upload a vid of me swinging this around, I’ll include it here. For now, just trust me, the lights are SICK! They pulsate and show a sort of lightning within the blades. It’s VERY cool. Paint Application: Since the white is painted on and does not look like a template, your sword’s white paint may vary. I would rather there not be any of the white paint on the sword, especially at the tips of the sword. 8.5 of 10 medals. Playability: The sword has a LOT of playability. It’s fun to swing it around. Though, I do HEAVILY suggest you do so outdoors as it’s a fairly big toy. 10 of 10 medals. Value: At $60, this is a decent value. The near scale size really helps to bolster the price. The real value here are the electronics. That this includes both light and sound, motion activated too, is impressive at this pricepoint. I think the price is good considering what you get for it. 10 of 10 medals. Safety: The sword blades themselves are made of a softer plastic than the hilt. I do not suggest trying to bend them though as you will likely destroy the electronics inside. This said, you should be able to (carefully) clash your sword with another. The tips of the sword while not sharp could potentially hurt someone if you were to jab them straight on. So please, DO NOT do that… The packaging marks this at 8 years old or older. I would argue that it should be for older kids with a minimum age of 12. For one, it’s big, so a young child swinging it widly indoors could easily knock something over. 7.5 of 10 medals. Do I recommend this product? YES! 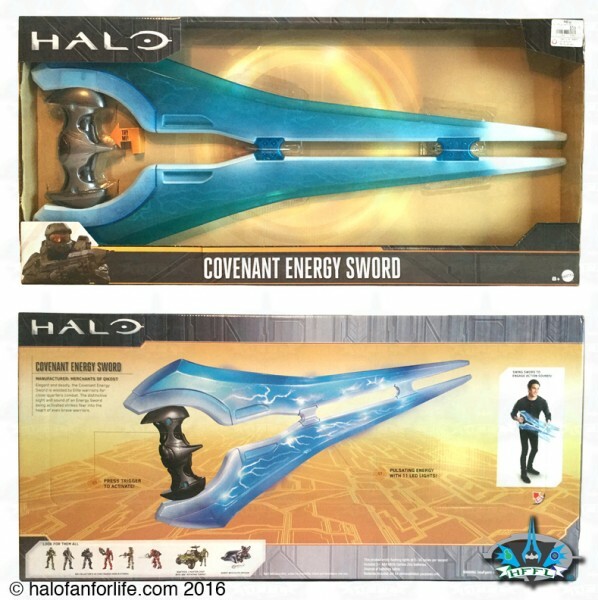 Having the mighty energy sword at near scale is an AWESOME addition to anyone’s collection. If you’re on the fence, GET IT! I have not seen these in great numbers, so you may miss your chance to get them at retail if you don’t picl it up when you see it.